Western blot analysis of Baculovirus-expressed PKC isoforms alpha, beta, gamma, delta and epsilon, untreated or treated with lambda protein phosphatase, using Phospho-PKCalpha/beta II (Thr638/641) Antibody (upper) or PKCalpha, beta, gamma, delta, epsilon antibodies (lower). 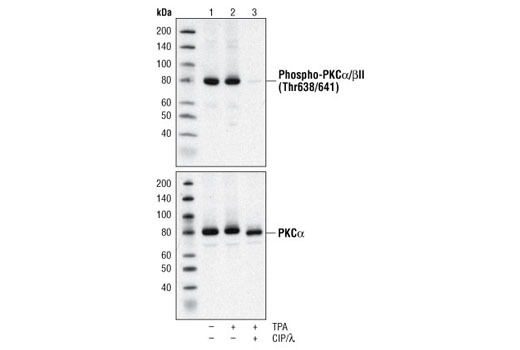 Western blot analysis of extracts from 293 cells, untreated, TPA treated (200 nM), or treated with TPA and CIP and λ phosphatases using Phospho-PKCα/βII (Thr638/641) Antibody or PKCα Antibody #2056. 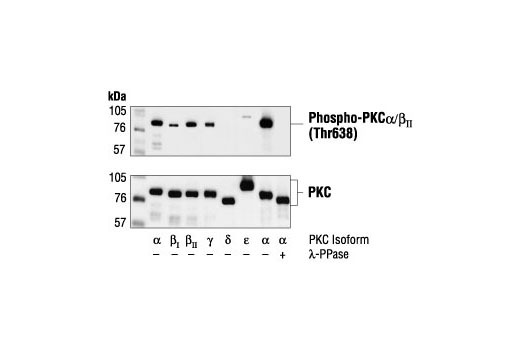 Phospho-PKC alpha/beta II (Thr638/641) Antibody detects PKC alpha only when phosphorylated at threonine 638 and PKC beta II only when phosphorylated at threonine 641. This antibody also reacts with gamma. Polyclonal antibodies are produced by immunizing animals with a synthetic phosphopeptide corresponding to residues surrounding Thr638 of human PKC alpha. Antibodies are purified by protein A and peptide affinity chromatography.